I felt a little cursed this weekend. All around me, people were falling and nothing seemed to be going my way. I won't get into too much detail, but my dad took a really bad spill while we were out hiking yesterday. He's in a lot of pain, but will be ok with lots of rest and ice over the next couple of days/weeks. I witnessed it and that was no fun, especially because I couldn't do anything to stop him from falling. 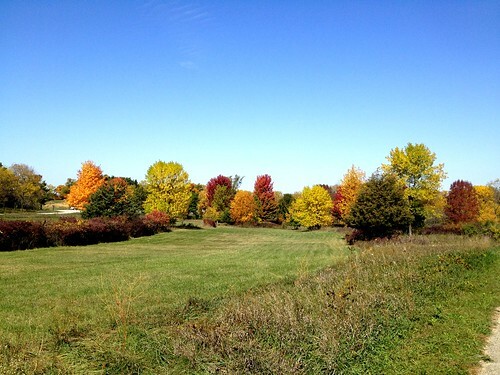 Despite what happened, we had a gorgeous day to experience the fall colors at Lapham Peak. After I left my parents's house, I went to the mall to use a coupon that offered $50 off a purchase of $100 or more. The store that offered it was a mess. It felt like Black Friday or Christmas Eve in there. I couldn't find a thing I liked or that worked with all of the coupon restrictions. I headed upstairs in the store to check out their coats and an older woman who was about 7 steps below me fell on the escalator and hit her head. It was my first time seeing someone fall on an escalator like that. I work in a place where kids always fool around on escalators and they are not the place to be doing so. She was fine in the end and I was shaken up because I had already witnessed a bad fall. It was not fun to witness two older people hurting themselves in one day. 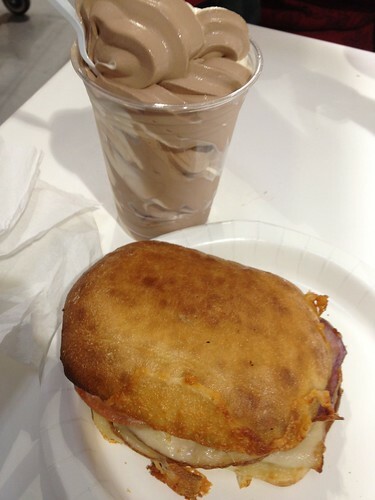 Onto happier things, like comfort food! 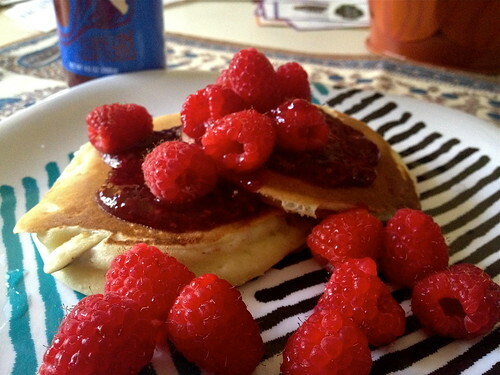 I made pancakes this morning and topped them with fresh raspberries and the raspberry enlightenment from Penzey's, which was a great combination! Craig didn't have the fresh raspberries and wasn't as impressed with the raspberry sauce. 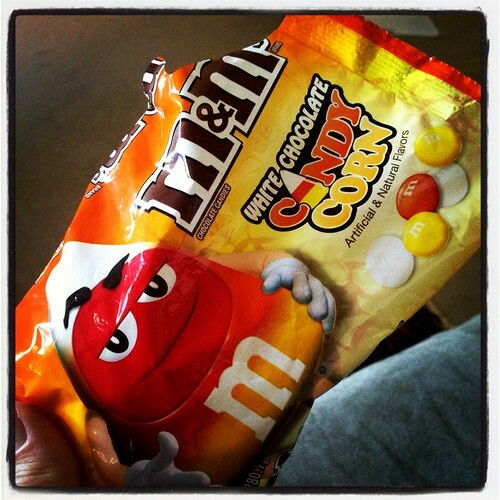 Craig and I went to Target (my happy place) this afternoon and I found these, so into the cart they went. 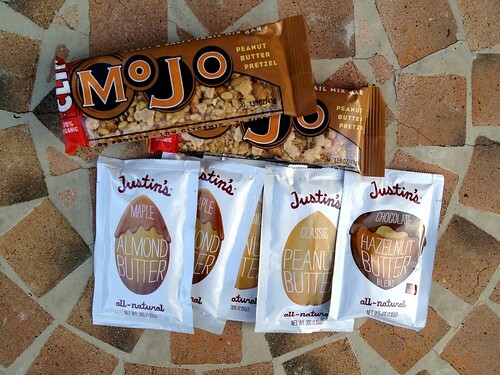 They are really good and super sweet, so I couldn't eat too many without feeling sugared out. 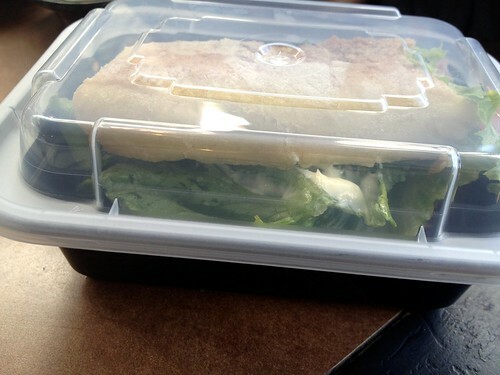 I compensated by buying spinach and eating a big salad for dinner and packing one for lunch tomorrow. My work is having a bake sale fundraiser for a co-worker who got hurt in a bad accident a couple of months ago. 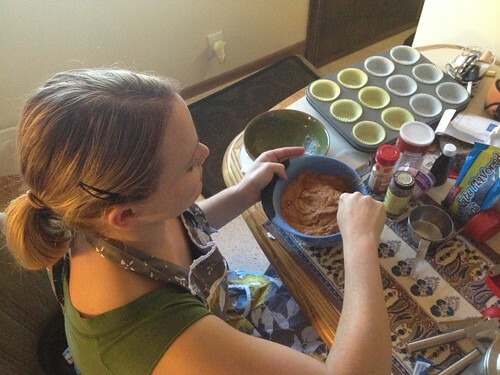 So, I put on my apron today and baked Pumpkin Spice Chocolate Chip Muffins. Yes, our kitchen floor is totally 60's and not my fav and I have a hole in my slipper. I wear these LL Bean slippers out until they are completely unwearable. 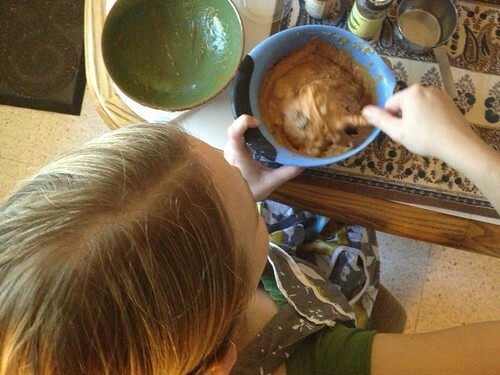 Here I am baking--thanks to my sweet hubby for taking photos. I just realized it's my first time making anything for a bake sale! 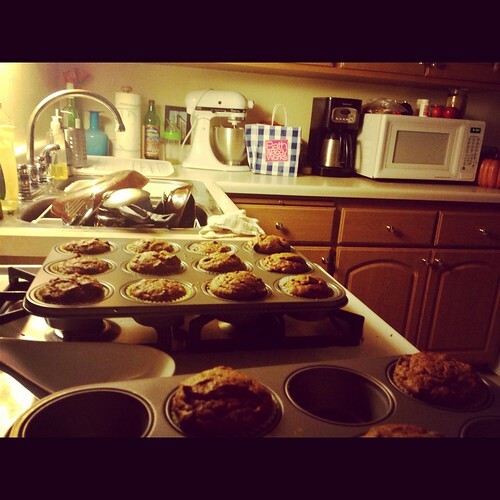 I am glad the muffins turned out really well and I hope there are a lot of pumpkin fans among my co-workers. I got to the gym twice this weekend. I managed to work hard enough yesterday that I feel some muscle fatigue today. I attribute it to the squats I did with weights and on the bosu with just my body weight. My knee has been aching lately, so I am trying to be careful and yet build up the muscles around it to make sure I don't injure it. I ended the weekend by shopping online. My black boots are falling apart on the bottom (seems to be a theme with my shoes lately) and so I bought these beauties in black. 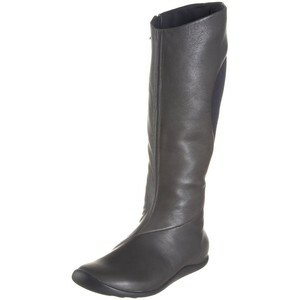 I have been looking everywhere for new tall black boots, but they have to be flat, comfortable and look sort of European to me (this is how I define it instead of "cowboy boots"/American), etc. I just hope I love these when I get them in the mail and that they fit great. I have better luck with shopping online lately, so I took the risk and figure I can always return them. Time to get ready for bed! I can't believe the weekend is over already. I hope next weekend is a bit more calm (and this week is too). While I wish this post was about actually going to Red Mango in Fox Point for some delicious frozen yogurt, it isn't. Instead, I am happy to share this opportunity for any locals who can attend an opening party and blogging event today, Saturday, September 29th from noon-4. 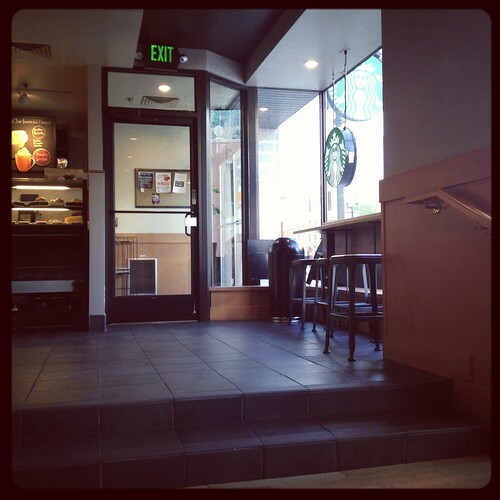 There will be a blogger station with free wifi for blogging during the event! 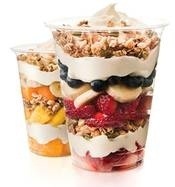 Residents will be treated to a free small yogurt with their choice of toppings and the first 100 guests will each receive a Red Mango t-shirt. There will also be a photo booth to take photos of themselves with their Red Mango creation, photos with Miss Mango, music and more. It's their way of celebrating the new store opening in the community and thanking local residents. 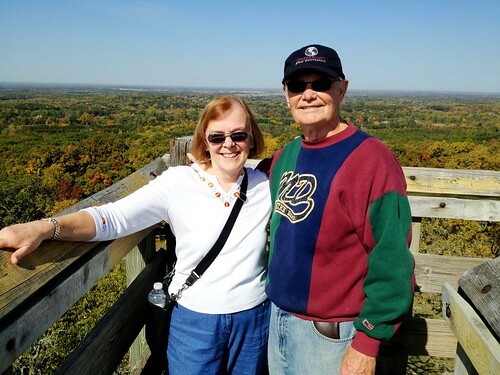 I had previous plans to take my parents hiking at Lapham Peak, so that's what I'll be doing! I've never been to a Red Mango, but I definitely will check the Fox Point one out soon! How is your week going? Mine has been pretty good so far! I don't think a lot of Packer fans can say that today after that horrible referee call last night. 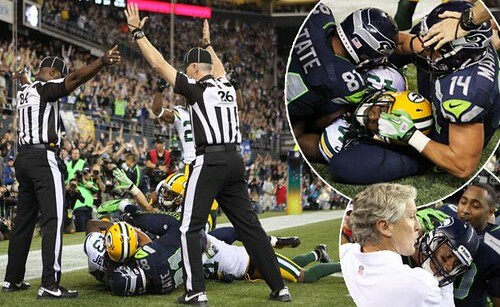 I don't watch football, but even I was shocked and angry when I saw that play on the news this morning. My favorite headline was "Clueless in Seattle." I've had quite a calm come over me lately. I don't know if it was that week of vacation I took, that I am still feeling sort of out it from this never-ending cold virus or that meditation is the cause of it. Whatever it is, I am thankful for the feeling. I have only had two this season and they have hit the spot! For some reason, they taste much better than I remembered them tasting last year. I think it's my imagination though. Dinner tonight was kind of my go-to meal: quinoa with whatever I can find to dump in it. 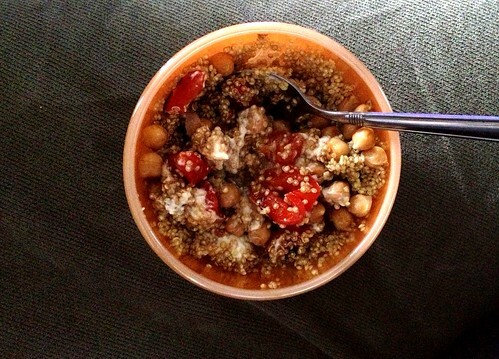 I mixed together Trader Joe's roasted red peppers, quark from Clock Shadow, feta cheese, various spices, sea salt and cooked chickpeas. I made enough for leftovers for our lunches too. Instead of going to the gym, I took advantage of the crisp and beautiful weather and went for a bike ride. There won't be many more evenings left to do that, so I figured I should spend some time outside. 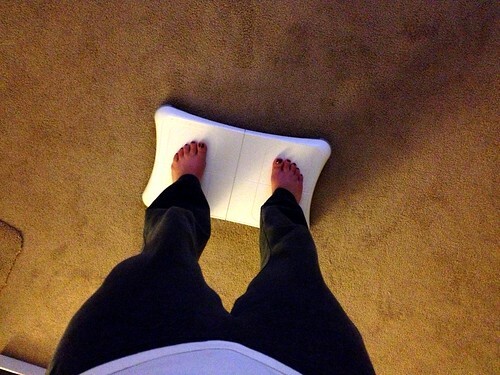 Craig suggested I also do Wii Fit, which I haven't done in ages. I got a half hour in on there and it felt great to have fun while playing various balance and cardio levels. My favorite is catching the fish in the penguin balance game. :) I also did step aerobics on there for 10 minutes, which got me sweating! 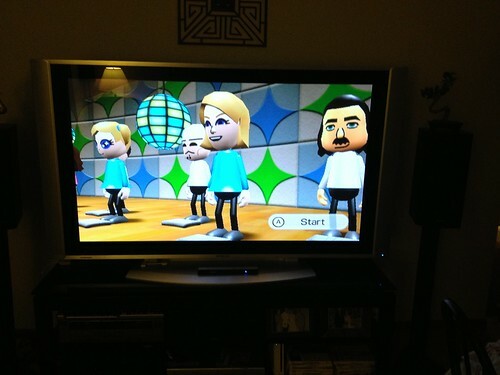 It was a good reminder to pull out the Wii more in the winter months, when I don't feel like going to the gym. After being sick all week, we finally got out of the house today and had some fun at Doors Open Milwaukee. More on that in a separate post. I barely did anything yesterday because I pulled a muscle in my chest/back from coughing. Luckily, I felt much better when I woke up today and it only hurts a little. This virus is not leaving my body and it's maddening. 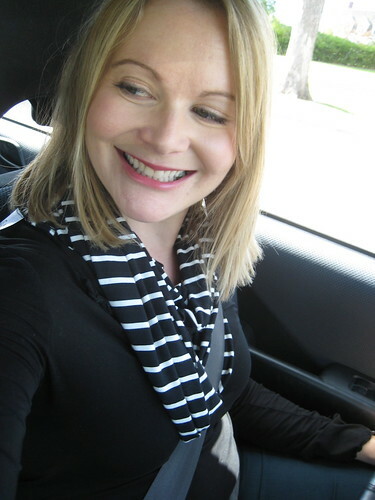 I was sporting a new infinity scarf from yala designs today...it's made of viscose from bamboo and super soft! The only thing I will have to be careful about is washing it and the other items I ordered. They say to launder with gentle soap, but don't consider Woolite a gentle detergent. Craig and I took a break from Doors Open mid-afternoon and went to Beans & Barley for lunch. I wanted to choose something I normally wouldn't make at home or find anywhere else, so I ordered a Walnut Burger. Here's the description from their menu: A seasoned walnut & cheese patty from Wisconsin's Historic Trempealeau Hotel. We serve the burger on a rustic sandwich bun, with mayonnaise, lettuce and tomato. 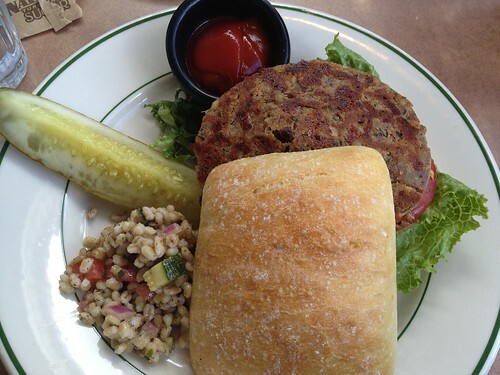 It was really delicious and a moist veggie burger. I loved the bun as well. 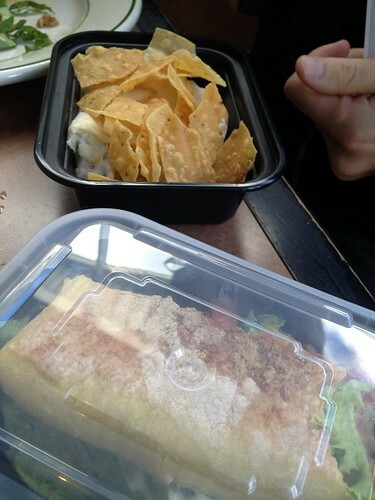 We both couldn't finish our meals and decided to bring half home. I loved that the boxes they gave us are reusable. We hadn't been to Beans & Barley for a couple of years, so it was good to be back. I always enjoy checking out the attached market too. I am sick with a really bad cold. On Saturday, I got a sore throat and then on Sunday, it progressed into sneezing and stuffiness. I thought it was just allergies at first, but confirmed it wasn't with the other symptoms I was experiencing. I went to work yesterday and left halfway through the day. A co-worker cannot get sick right now and I felt bad that I even came in and exposed her to my germs. So, I stayed home today and am trying to rest as much as possible so I can go back tomorrow. 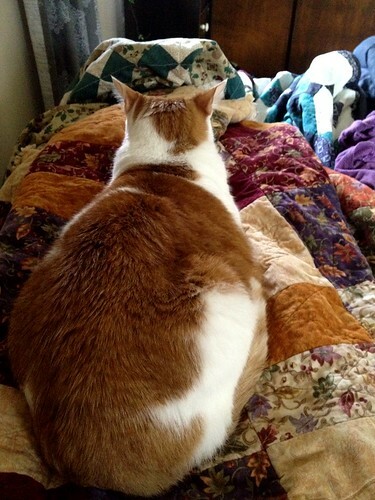 I've been sleeping with the cats laying on me. 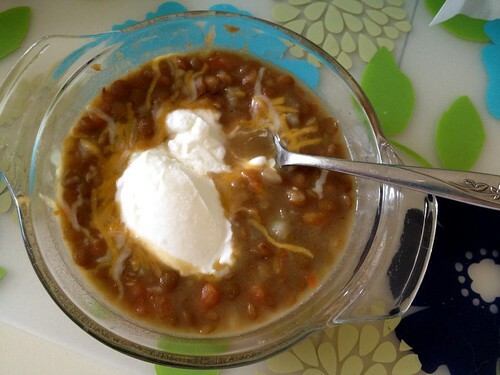 The only thing food I have been craving this week is this Amy's lentil soup. 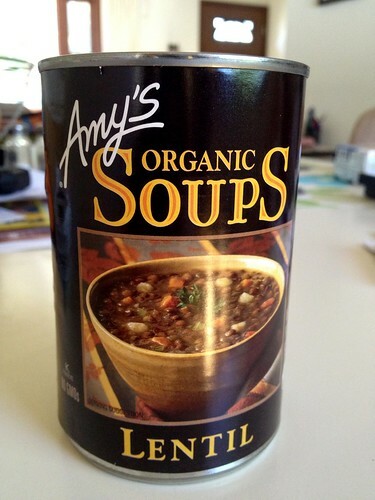 Before I got sick, I stocked up on this soup when I found a big package of cans at Costco for a really good price. I put shredded cheese and Chobani on top. Oh and avocado is divine with it too. I just wasn't feeling the avocado today. My one big accomplishment for today was figuring out the source of moths that have found their way into our house. I suspected it was bird seed we had to bring downstairs to the basement (because of a mouse in our garage that eats our seed) and sure enough, a tiny worm I thought I spotted on the bag the other day looked like it was now developing into a moth. Gross. That bag promptly went outside and when I went to the bucket we keep the rest of the bird seed in and opened it up, there were about 10 moths inside. Aaah! Not fun to find when you feel like crap already and don't have much energy to deal with anything. I am just happy I found the source of the problem and I pray we don't have major moth problems in the future, especially in our food. The best blog post I found on moths was this one and it helped me identify the worm on our bird food bag. Stay healthy! 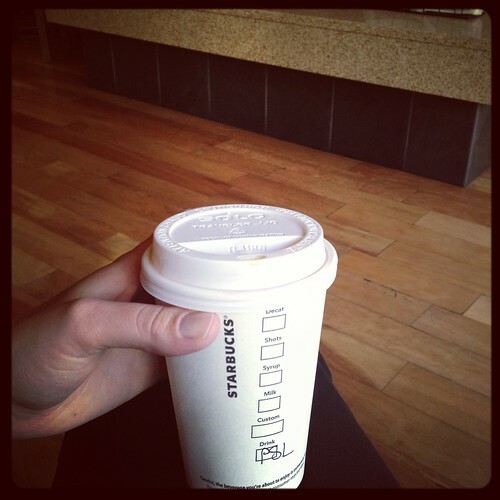 You do not want this cold because it has made me feel pretty miserable for the last couple of days. 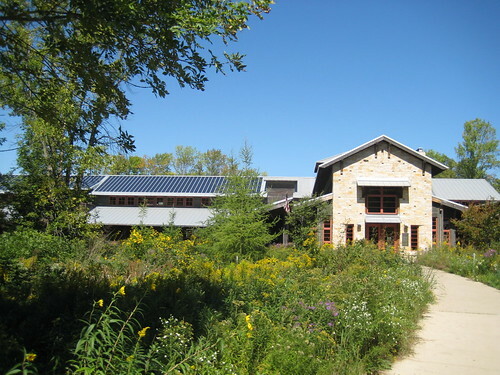 Yesterday, Craig and I went to the Schlitz Audubon Nature Center for a raptor program and to hike a bit. 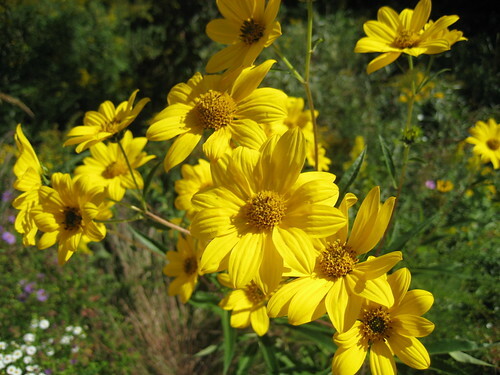 There were many pretty wildflowers on the property! The one thing I was most excited to see was the raptor program. 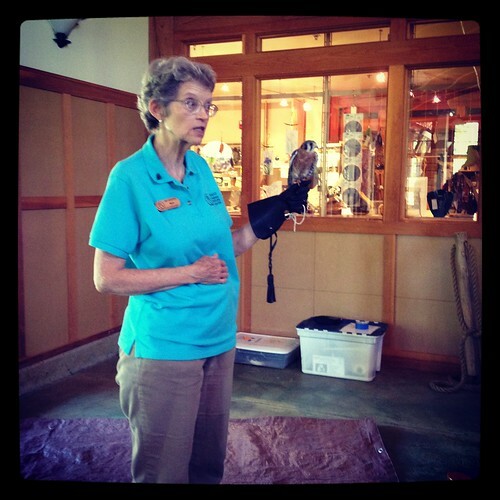 A kestrel was brought out and he stole my heart. I love birds and am fascinated by them. I even grew up with birds as pets. We then went on a small hike on the trails overlooking the lake and with lake access. 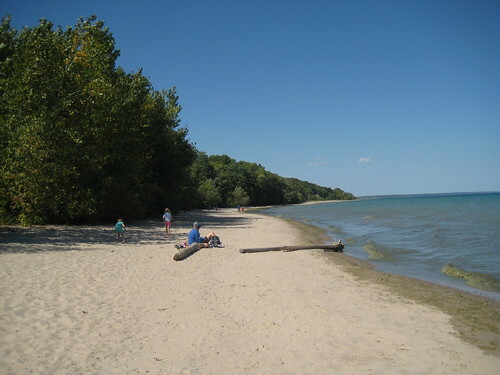 The weather was gorgeous and it was such a clear day that we could the Wisconsin shoreline extend northeast about 50 miles. 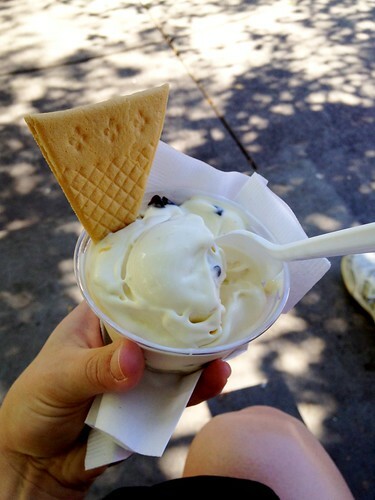 After the hike, we cooled off with some Kopps custard--I got chocolate chip cookie dough. 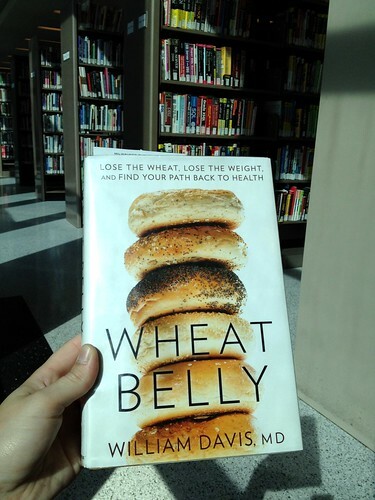 I picked up Wheat Belly at the Central Library. I started reading it last night and discovered that the author is a cardiologist from Milwaukee! So cool! I kept hearing about this book and was intrigued. I'll let you know how it is when I finish it. Anyone read this yet and have feedback to share in the comments? This morning, Craig and I played tennis (I won, hooray) and then we did a dreaded cleaning behind our refrigerator. Oh man was that gross. I feel better now that we got the dust and dirt out from underneath. The only problem is that I have experienced bad dust allergies all day as a result. No fun! It's just beautiful here, so I think I am going to take a walk outside and listen to a fitness podcast. The rest of the week just flew by. I was barely home, but I feel like I accomplished a lot. 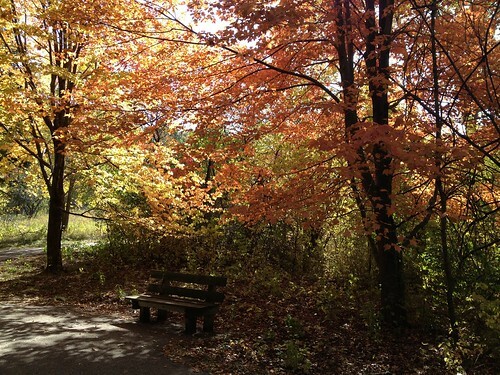 On Wednesday, I drove out to Menomonee Falls to meet up with my friend Danielle. 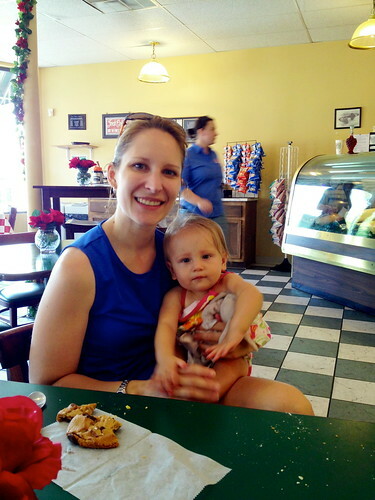 We walked on trails for an hour and 10 minutes, picked her one daughter up from daycare and then went to lunch at Nino's Italian Bakery and Deli. It was our first time trying it and we were pleased we did! 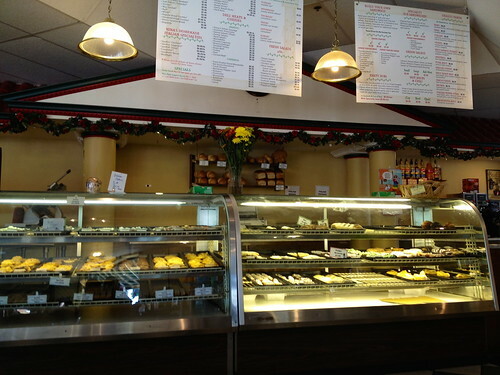 They had a great selection of sandwiches, plus Italian desserts, fresh bread and a small selection of Italian groceries. 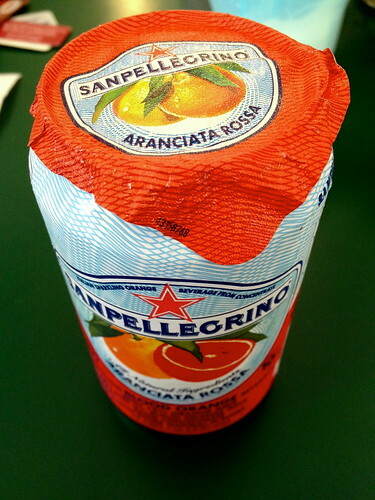 I had a delicious blood orange San Pellegrino. Lunch was a veggie panini, which hit the spot after working up an appetite on that long walk. 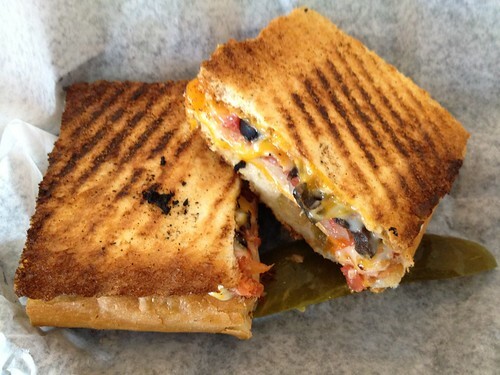 The panini had giardiniera (pickled vegetables) on it and I may add that to my paninis at home once in a while. 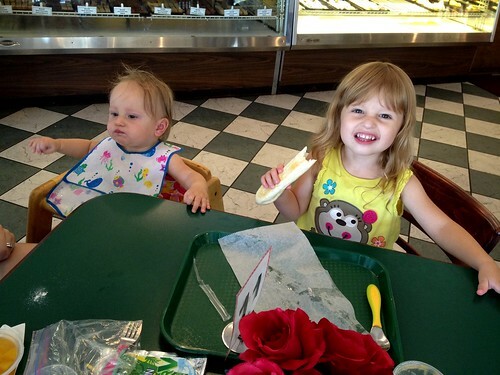 These girls were a lot of work to have lunch with! 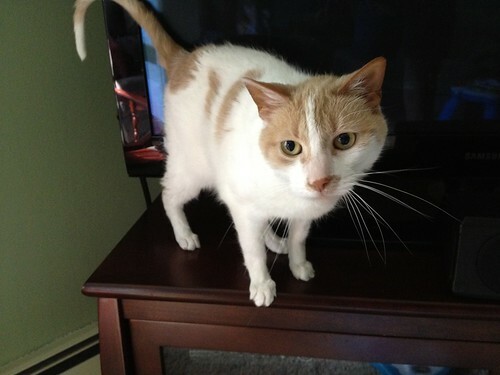 Danielle's three year old has tons of energy and is so curious about the world! We all grabbed cookies for dessert. 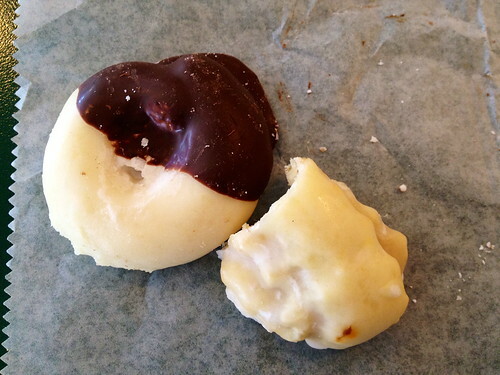 I picked out two small Italian ones--a black and white and an almond. Both got touched by the three year old a couple of times and while eating her own cookie, she asked me about ten times, "Can I have some of your cookies?" After lunch, we went back to Danielle's house and chatted. I played with her cats, who loved the attention. Then it was off to Woodman's on my way home! I bought a huge cart full of groceries. 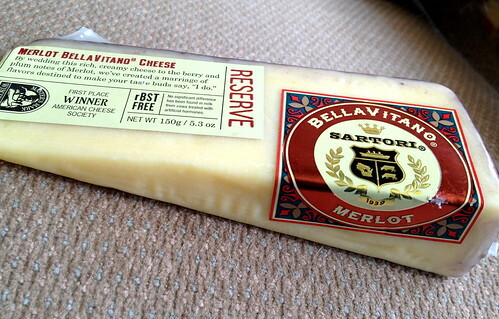 I was pleased to find the Clock Shadow Creamery quark and BellaVitano Merlot cheese. 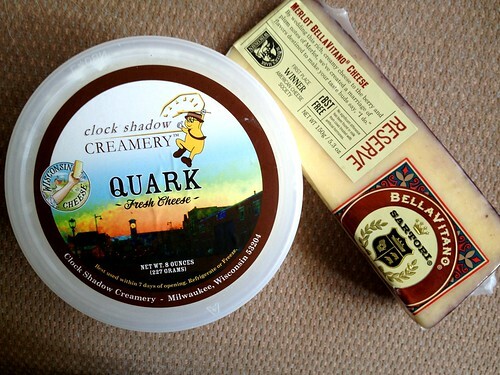 Hooray for Wisconsin cheeses! I also stopped by REI on my way to meet Danielle and picked up all of this for only 40 cents, thanks to my REI dividend. On Thursday, I went to spend the day with my parents. 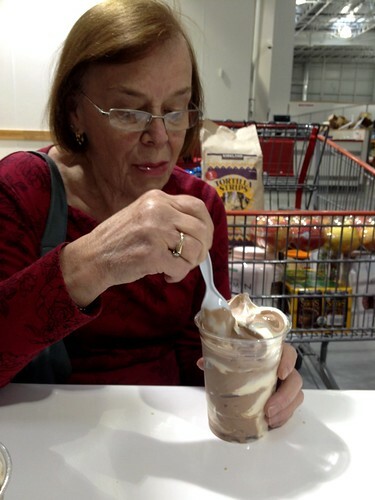 Mom and I took a trip to Costco, where I had to get new passport photos taken. Let's say they didn't turn out that great, but I am glad I have my request for my name change done and in the mail. I was hungry by the time we finished shopping, so I got a really yummy turkey, provolone and pesto spread sandwich at Costco. Mom and I also indulged in some swirled fro yo from there. The amount we got was huge, so I had to bring half of the sandwich and the fro yo home with me. After our lunch settled, my mom and I headed over to the brand new YMCA in Mukwonago. My parents had already been to it before, but it was my first time checking it out. I didn't bring a camera to take photos, but it was gorgeous and made me wish we lived closer to that gym vs. our own. Mom and I walked/ran the track, lifted weights, I showed her a few machines and the kettlebells and we even played basketball for a little bit. Their pool has a big water slide, a lap pool, section for walking in the water, a whirpool and a separate water aerobics pool. 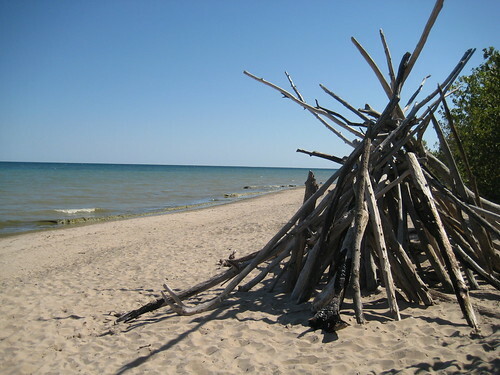 I hope to check that out next time we go, but I am not a big swimmer. Two days after that workout, I am still store from doing squats with the kettlebells. I really enjoyed using those again and wish my YMCA had them. I guess I can use dumbells to do similar moves though. I can't believe I only have one more day off and then it's back to work! Yesterday was definitely productive and one of the happier Mondays I have had in a while, mostly because I was free to do whatever I wanted. 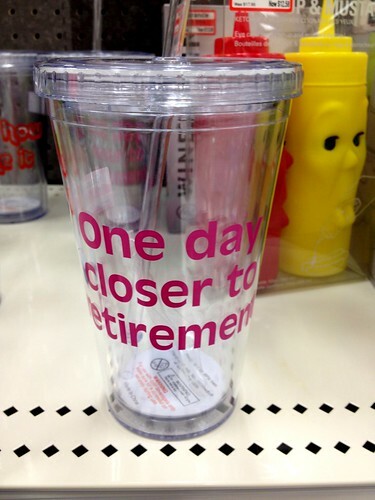 Maybe I should have bought this cup at Target after all? 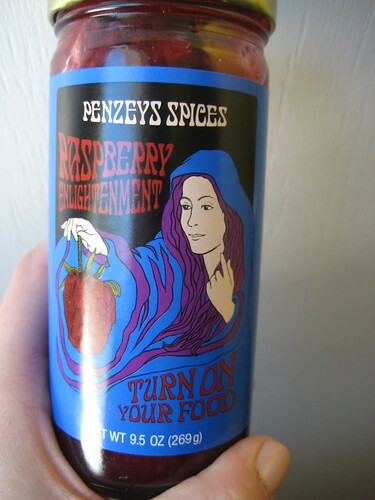 I went to Penzey's to purchase something so I could get an item for free. 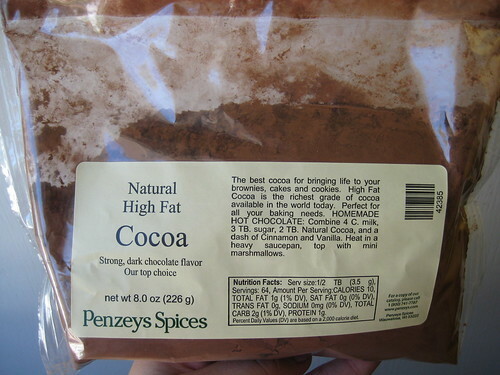 I got the Natural High Fat Cocoa that my mom loves and makes brownies with. Now I need to figure out what I am going to make with it. The cashier suggested a nice chocolate cake with raspberry filling. This jar was free with my purchase of $5 or more. Isn't the label sweet? 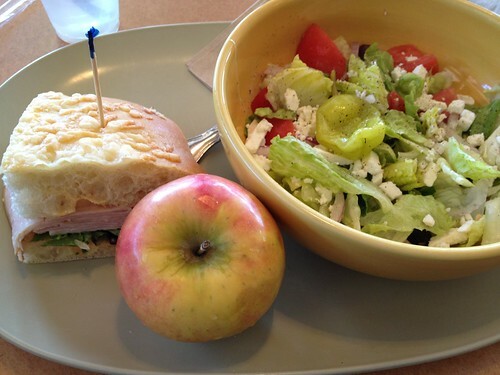 Halfway through my errands, I fueled up at Panera bread. I really love their greek salad. 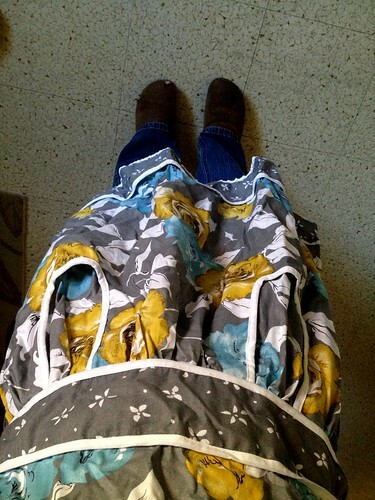 I must find a way to make that salad dressing at home! 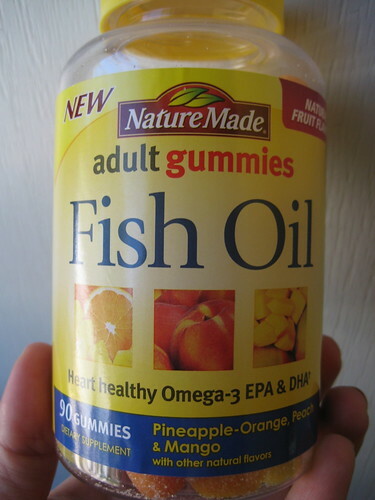 I found these new fish oil gummies at Target. Even better, I had a $3 off coupon, so they were pretty cheap. I am all about the coupons! I tried two when I arrived home and they were yummy. They didn't taste like fish at all, which is always my worst fear because I do not like the taste of fish. I like the gummy form vs. the pills because my doc tells me they are easier for me to digest. 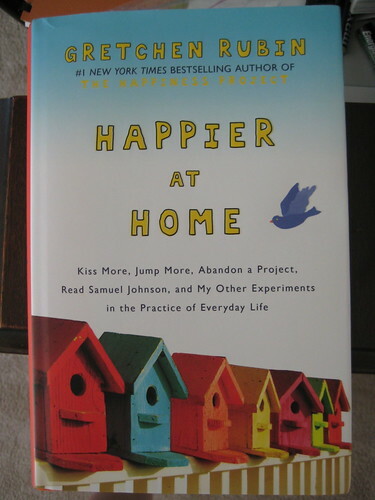 When I arrived home, I found Gretchen Rubin's new book, Happier at Home, in my door! I won it from her publisher directly and I am so excited to read it. I just have to get through a stack of magazines and some library books first. 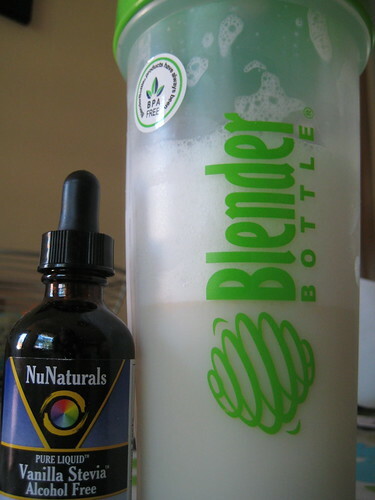 I worked out in the afternoon and recovered with protein powder and milk in my new BlenderBottle. I added some vanilla stevia and it added that bit of sweetness it was lacking before. The BlenderBottle mixed the protein powder well and I was so full after having 19 grams of protein in a matter of minutes. Craig and I took a very long walk after dinner. We spotted mice (eek) in a few yards. I don't like rodents. Craig insists that they are cute. Yeah, not convinced! I have been cleaning and doing laundry today. 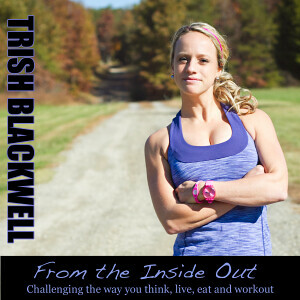 I need to get back to some of that and take a walk while listening to some fitness and nutrition podcasts.